Unpredictable twists and turns are an inherent part of play’s beauty – adventure and discovery, the lingua franca. Resilience is the pièce de résistance, a piece that in later life can make all the difference. 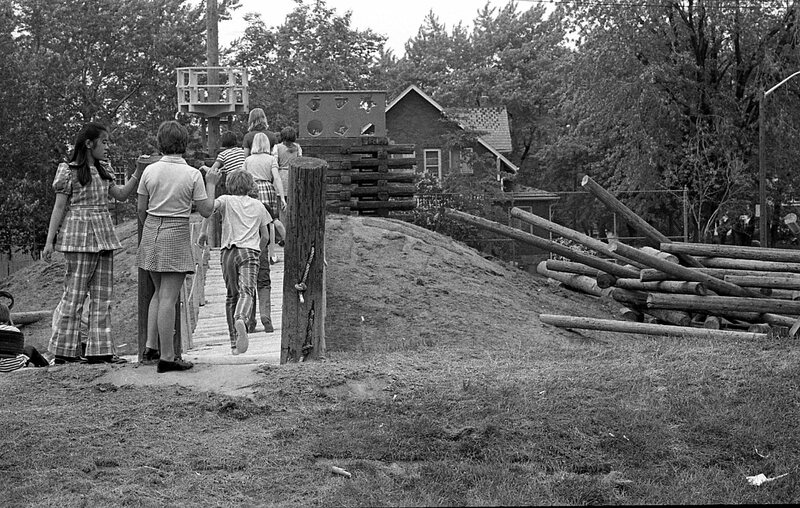 Spring Garden Public School – Photo credit: John Mahler, The Toronto Star – 1979. Twists, turns and discovery are also hallmarks of the sedentary surfer. The internet of play offers seemingly endless redirections and constant parsing of new, unanticipated information. As frequently as not, the eventual destination is altogether different than what was initially intended. 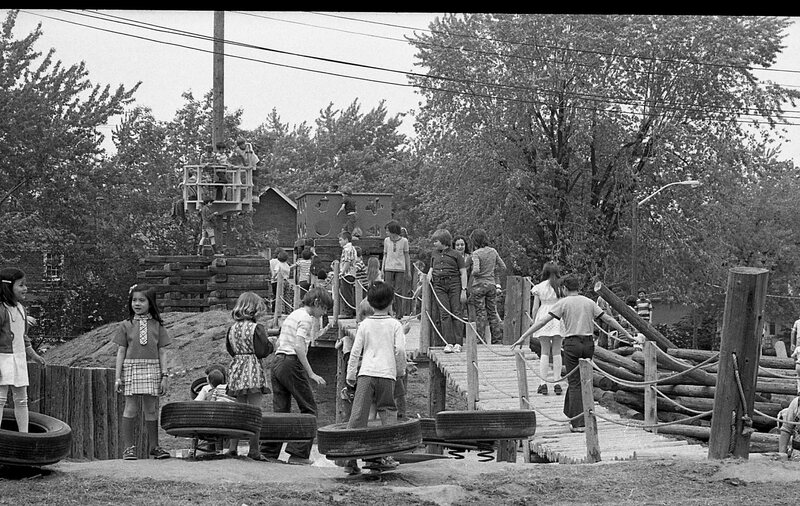 As dawn breaks on drifting white dunes of snow outside my window, I discover an early 1970s playspace in Toronto. 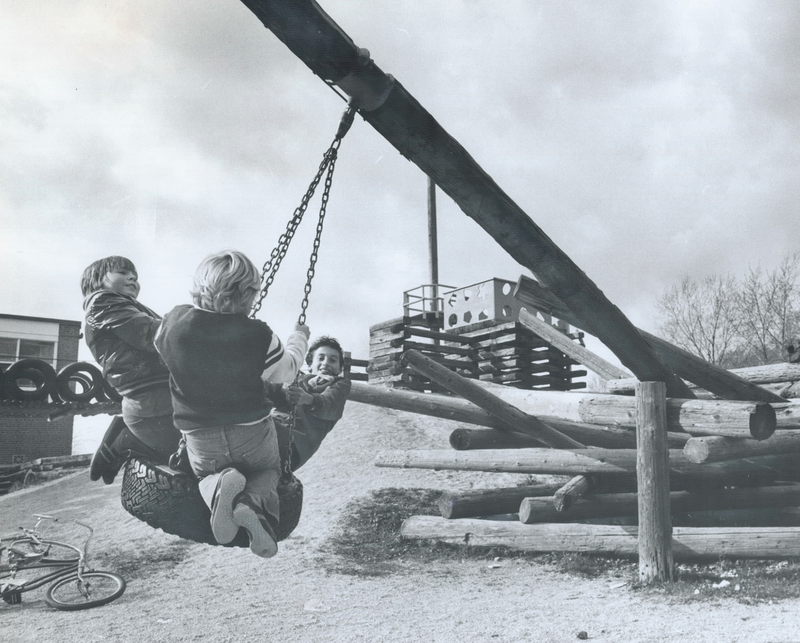 I arrive by way of an article that reports Crow Nest Adventure Playground in Dewsbury, UK may be subject to cuts. From there, a Google photo search takes me to a photo of a playspace in Bowood, Wiltshire, UK. This in turn leads to Spring Garden Public School via an UrbanToronto forum and ultimately to an index of photos by Bill Chambers reproduced here. I look the place up on the map and it’s in Willowdale, North York. Though the school is no longer there, I see it was close to where I lived from about 1964 to 1970. Those days, we would walk through that neighbourhood on our way to the Willow Theatre and the Memorial Swimming Pool and that little corner store where we could buy 10 cent bottles of mini-pop and get a nickel back on the empties. Those were the times that my friends and I first started getting out and about independently. 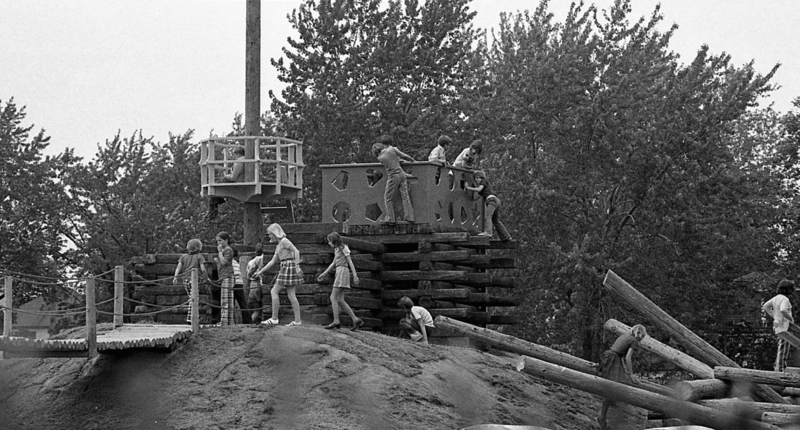 I can imagine myself playing here – hanging on in the crow’s nest, trying to balance on and climb the logs. It helps to see kids dressed pretty much as I had back in grades 7 and 8 – in those rockin’ late ’60s kids’ togs. The space must have been created after our family left the area. I can’t believe that our parents wouldn’t have brought us to this cool spot, or that we wouldn’t have heard about it ourselves. Today, mysterious algorithms present a gift that in three of four jumps bring me from the UK to a familiar space close by my old childhood neighbourhood. The black and white blast from the past is a nice visit. Here, before my eyes, the kids are exalting in the snow. The white dunes outside the window have been tamped down through the course of the day by their sledding and their first attempts at cross country skiing. This is the place to be.